At the end of April 2011 the Central States Numismatic Society held it's 72 Anniversary Convention at the Donald E. Stephens Convention Center in Rosemont, Illinois. During that convention there were several "encased" related occurrences. First was that I put together an exhibit of encased coins. It was titled, "Encased A Variety of Varieties". the fours cases contained almost 60 individual encased pieces. 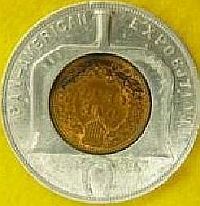 the purpose of the exhibit was to demonstrate the wide variety that encased coins come in. From the various styles of encasements; round, horseshoe, chamber pot and wishbone, to different encasement materials and coins. this was my first competitive exhibition. I was gratified and pleased to receive a 2nd place in the "Token" category. Then while taking a moment from my convention staff duties I came across two encased silver dollar pieces at Paul Cunningham's table. I quickly negotiated a price for both of them with Paul and moved on. Paul is the only dealer that I can see who carries a large stock of encased coins. Paul's website Cunningham Exonumia can be found here at cunninghamexonumia.com. 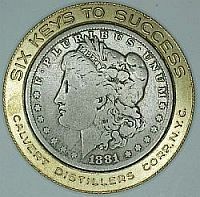 1881 Morgan Silver Dollar Encased - Calvert Whiskey "Six Keys to Success" "Calvert Distillers Corp., N.Y.C." During the Convention Ray Lockwood, CNSN Education Director, presented a talk on, "The Case for Encased". Due to my convention staff work I was unable to attend, but was told by David Lisot that it was the best attended of the educational presentations. 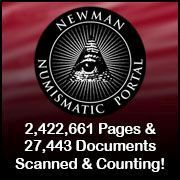 During Ray's talk he mentioned this website and my exhibit. David further mentioned to me that, "The audience was really into it! They were asking questions and excited by Ray's presentation. 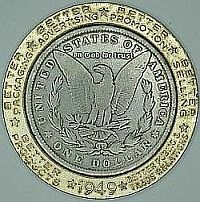 They group was astounded that no one knows what the rarest encased coin is."